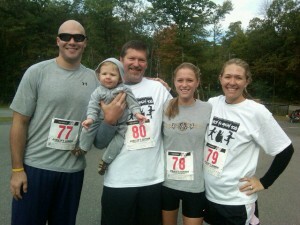 This weekend I ran in the “Trot For Tots” 5k in Andover, MA. What they don’t tell you when you do these things is just how miserable it really is. Sure the smiling kids standing along the course are a bonus, but running for extended periods of time is a new kind of awful. I’ve been a part of a lot of training camps, some awful practices, and conditioning sessions in 100 degree heat. But this, this was different. I’ve never run anything over a mile in my entire life–and I mean that. The last time I ran a mile on pavement was The President’s Physical Fitness Test (do they even still do that?). Football/Lacrosse/Hockey–the sports I played in high school are all built on sprinting. My time at UConn/European League was more of the same. 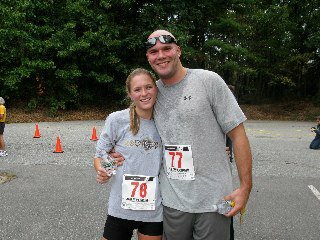 Combine the humiliating fact that I ran this with my girlfriend (former track standout) , and the future in-laws (all of whom are great athletes) and I was shown up. I posted a time of 24 minutes, 20 seconds– shame on FWG. c’mon Rob……it’s in the genes man. I ran a 26.2 mile marathon in 1980 in 3:12:40 and not even a footnote in your blog post. Just kidding of course because that’s a great achievement on your part. Maybe not as thrilling as getting a game ball for defensive player of the game against Rutgers (ESPN tonight by the way) but still a huge accomplishment, Way to go!! !